A voyage of discovery awaits on the beautiful island of Cyprus. Whether that's an expedition to find your dream beach or an excavation of the island that uncovers plenty of historic gems – the choice is all yours! Maybe a dash of each sounds like the perfect holiday plan? If you just love the great outdoors you'll feel right at home here too. 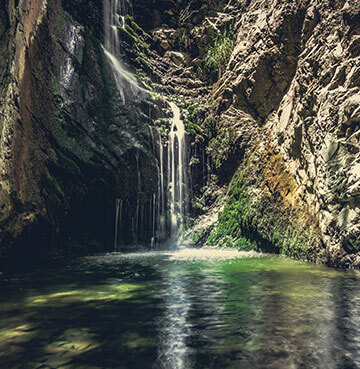 Mountains, waterfalls and dense forests – Cyprus is like a snapshot of nature at its very best. So if your boots were made for walking, you'll love stretching your legs on your Cypriot adventure. Below you'll find our guide to the best things to do in Cyprus. There's so much to see and do that you might just decide to head away for a little longer, leaving no stone unturned on this rugged island. Cyprus is jam-packed with cultural gems, as historic sites and monuments are dotted all around this amazing island. The Tombs of the Kings might even draw you underground to discover their charm. Once the resting place of well-respected government officials, today you'll find history buffs wandering through these chambers. Interestingly royalty was never actually laid to rest here, it's the magnificent designs that led to this title and many remain just as impressive to this day. With the Cypriot sun beaming down there's only so long you'll want to spend underground. But fear not, increasing your cultural clout doesn't need to stand in the way of topping up your tan. 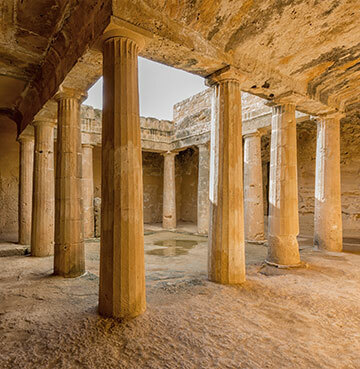 Head for the Kato Paphos Archaeological Park and wander through the ancient ruins, basking in the Cypriot warmth. Roman villas, mosaics that depict scenes from Greek mythology, and an impressive castle – this feels like your own archaeological expedition. Paphos might take most of the plaudits for culture and history, but Limassol also packs a punch when it comes to monuments with a story to tell. Why not head to both? Each offers its own take on Cyprus' past, so after a day at each you'll be able to put all the pieces together. Close to the city you'll find the remains of Ancient Kourion. The Roman baths and villas are well worth a wander, but the amphitheatre is as must-see as they come. An impressive cocktail of sea views, incredible preservation and space for 3,500 spectators – it doesn't get much better than this. Limassol Old Town is a maze of narrow streets, where getting lost is all part of the fun. As you wind your way around, you'll happen upon plenty of traditional Cypriot buildings. And you're never too far from the fascinating 14th century castle. So getting your bearings is a piece of cake! If you love hiking, trekking and the great outdoors then you'll probably struggle to find a better destination than Cyprus. And we're not making mountains out of molehills here! The island's Troodos range is home to Mount Olympus, with it's peak standing at almost 2000m tall. So it might be time to set aside a little suitcase space for your hiking boots? Comfortable socks are a must too, as there's just so much to see and do. 'Just five more minutes and we'll head back' seems to take you onto the next village, waterfall or amazing stretch of forest in this wonderful national park. With an extra spring to your step from all these amazing sights, who knows how much ground you'll cover. And after expecting a relaxing getaway, pained pedometers might even struggle to keep up with your step count! Maybe the mountains just haven't peaked your interest? 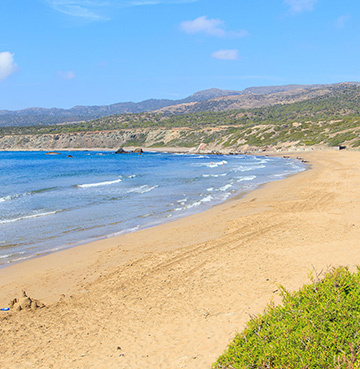 The Akamas Peninsula National Park offers strolls with coastal views and lots more. Picture yourself on nature trails that wind their way through traditional villages and plenty of stunning sights. The Avagas Gorge is well worth exploring on foot, as you'll discover rare flora and plenty of animals in this rocky valley. There's two trails that take you to the Baths of Aphrodite too, where a wave of natural beauty washes over you. This is where the Goddess of Love came to bathe in the cavernous pool, before meeting her beau Adonis in this very spot. You're never too far from a beautiful beach on Cypriot shores. The coastline here feels like a dot to dot of quiet coves, amazing beaches and breathtaking bays, with just a short line for you to fill in between. So why not hire a car and explore? Who knows, your next pit stop could be in sandy paradise! If you're yearning for a little peace and quiet, look no further than Lara Beach. You won't any find watersports or beach umbrellas here. This curving arc of golden sand is where turtles hatch and head off into the sea as their life begins. So while these protected eggs are nesting, you could be resting, relaxing and soaking in the beautiful views. Maybe you need somewhere a little livelier, with a few more activities? Coral Bay is the perfect place to come out of your shell! This 500m stretch of shore offers a number of watersports, giving you the chance to get out on the open ocean. It's also an amazing fit for families visiting Cyprus. Your kids will love splashing around in the calm and shallow waters – while you'll have peace of mind that this is a safe stretch for them to enjoy. There's lots of rugged charm to be found on the Cypriot coastline too, so you'll often find yourself between a rock and a hard place to resist. And Governor's Beach might just be the pick of the bunch! A clash of colours creates a wonderful spectacle here, with dark sand and white cliffs complimented by the sparkling blue sea. And with little bays tucked away behind the rocks, you could soon be laying claim to your own little piece of seaside tranquillity. It would be a crime not to mention Petra tou Romiou, home to the stunning Aphrodite's Rock. Just off the pebbly beach, this towering stone marks the spot where the Goddess of Love emerged from the waves. Watching the sun set behind this imposing sea stack is arguably one of the top things to do in Cyprus! So pack a blanket, find a spot and prepare yourself for this amazing display of nature.